This error appears twice when building the game as a standalone application. I've only started to run the game and it seems nothing related to the FSMs are affected, and no errors appear in runtime. What's going on here? Guidance appreciated! Re: huh? "Assertion failed on expression: '!go.TestHideFlag(Object::kNotEditable)'"
apparently you are doing something that is now not allowed anymore. 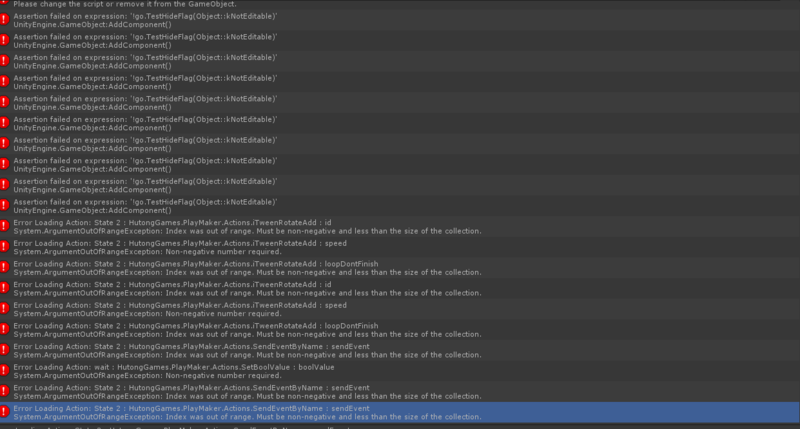 So I get that this error is thrown when trying to add a component to a prefab. In this case, this is error is thrown specifically when a build of the game takes place. Never any other time. The question I now have is... where does PlayMaker come into this, given all these PM messages are part of this error? Could it be that the Prefab in question has a PM script attached? It's likely that you try to edit a prefab asset instead of the instance of it during runtime. I don't think this is PlayMaker by itself that provoke this. so you need to go through your fsm and check that you are actually working with prefab instances, not the assets directly. It happened to me a lot, but I never had that issue per say, so you might do something to the prefab that I did not. uhm... have you reported a bug for this? Maybe there is something we can fix on our end, the fact that action where disabled maybe affect the way things gets serialized. Any ideas? I was supposed to launch a demo this weekend, this is a big time problem. I see Jean posted the thread that i also found, but i don't see where or how am i editing prefab instead of instance, nor how can i find the perpetrator. Just a quick update, i removed all errors, but nothing. How can find ANY pointer what to look for without the need to open every FSM and every state? Have you updated to the latest patch release?